South Lyon, MI - Someone has to do it. Someone simply must be responsible for discovering and reporting on the best new courses in Michigan. And that someone is MichiganGolf.com. Last year, we were the first nationally accessible publication to review Thousand Oaks in Grand Rapids and Island Hills in Centreville. This year both of these courses rocketed onto Golf Digest's list of Top 25 courses in Michigan. 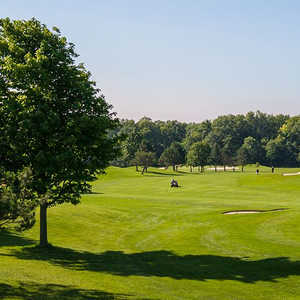 To continue the tradition, we are very pleased to bring you Moose Ridge Golf Course in South Lyon. Moose Ridge, just south of I-96 off US 23, is yet another Raymond Hearn design, which takes full advantage of the remarkably beautiful 230-acre piece of land from which it is carved. This par-71, 6,892-yard track will most certainly be named one of the top three best new courses in the state this year. And, as Director of Golf Rudy Catal confidently states, "Moose Ridge could be in the top 20 in the nation, if we do our jobs right." Raymond Hearn has certainly done his job right: He's adept at taking great pieces of real estate and turning them into even greater courses (e.g., Island Hills). At Moose Ridge, he has hewn one of the tightest, most demanding courses in the state out of a former raspberry farm, paintball battleground, and dense forest. If you are familiar with Timber Ridge in East Lansing or The Thoroughbred in Rothbury, just imagine them both combined into one course. The hallmark of Hearn designs is strategic holes: You have to play target golf to score. Moose Ridge's fairways are ribbon-thin, and often players shoot to blind or obstructed landing areas and greens. But Hearn assists the savvy with landmarks to aim at - fairway bunkers, trees, hillocks. Unfortunately for first-timers, you need to know what to look for. Or wait for the yardage books to be printed up. Among other details, yardage books are still lacking at this very new course. The grand opening is just coming up in June, 2001. Water stations, port-o-johns, and the clubhouse are also yet to be added to what will be a full-service, top-notch facility by fall 2001. The course itself, however, is amazingly well-developed, especially considering the terrible weather so far this season. As soon as you step onto the first tee, you realize that you'll need you're A game here - either that or you'll need lots of golf balls. The bentgrass fairways contrast beautifully with the overseeded Bermuda rough. And with thick woods, plentiful wetlands, and viciously sharp wild raspberry brambles pinching every single hole, you'd better hit ‘em straight. Brains, not brawn, are required: At least two of the par 5s - most notably the 515-yard 18th - are best played from the tee with fairway woods or irons (heck, I used a 5-iron on the 18th to make sure I had a safe second shot). There are also a few short par 4s (318, 355, 342 yards) where your big ego, er, driver, should remain in the bag. Most striking about this course is that 17 out of 18 holes deserve detailed descriptions. They are absolutely stunning, from tee to green. Only the 159-yard 12th - which still requires a tee shot over a pond - is even a smidge less than memorable. The one (count ‘em, ONE) hole with a generous fairway, No. 14 (590-yard par 5), offers welcome solace from rest of the constantly demanding layout. No. 1 (355 yards, par 4) snaps you out of the reverie you slipped into on the range, striking one straight, long practice shot after another. If you suddenly tighten up - "Just look at all those trees!" - you will need a mulligan. The 425-yard 2nd is classic Hearn: Aim at the giant oak. This a long dogleg left to an elevated, two-tiered green, all carry over postcard-quality bunkering. The bunkers, by the way, are filled with best-rated USGA sand, the same that you'll see in the traps at the US Open. The 630-yard par 5 4th is a nightmare for slicers. Well, as the number one handicap hole on the course, it's a nightmare for nearly everyone, but especially for slicers, as there is nothing but sand, knee-high heather, and trees to the right. More woods lie along the lefthand side of the fairway, and the green is small, shallow, and guarded front, left, and back by marshland. No. 8 (372 yards, par 4) features a strategic tee shot to a fairway that splits around enormous mounds and a moose-antler-shaped bunker. I still can't figure out what kind of a tee shot you need to hit to be able to see the green on your second shot…. Rudy Catal, Director of Golf, is reluctant to call any hole the "signature hole." "Players are telling us that they could all be signature holes," he grins. Nevertheless, the par-3 9th would have to be a serious contender. At 193 yards from the tips, the elevated green demands a complete carry over wetlands. Moreover, the green looks from the tee boxes to be tiny and tight - hemmed in on the right by trees and on the left by a dead drop-off. I believe it is also guarded by rabid skunks, just to make it even harder. Nos. 15 (par 4, 450 yards) and 16 (par 3, 209 yards) are the two of the prettiest tee shots on the course. The 15th is over water, and it may even be hard to carry for below-average players (so be sure to pick your tees wisely from the five options available). And don't be fooled by the fairway: It goes left, not right as it appears from the tee box. No. 17 is a devilishly long par 4 - 475 yards, for Hogan's sake! But mounding on either side of the fairway keeps all but the most Christianson-esque shots in play (ahem). But then, when you finally get to the green (a GIR here is an accomplishment in itself), if you happen to juice your approach, you're done, as certain death lies beyond the green. Finally, No. 18 is a rainbow-shaped, 515-yard par 5 where you either have to absolutely murder your tee shot past the tree at the bend, or swallow your pride and lay up with a short club in order to have a shot at a relatively safe second (and third). The approach here is the single design flaw, in my opinion: The fairway slopes left to right, as does the green. The problem is that the green is hourglass-shaped and small, with a steep hill and bunker to the left and an immediate drop-off into brush to the right. The amount of space available for the average golfer to land a ball on the front portion of the green is only about as big as two golf carts, and on the back portion, about as big as one cart. With the amount of slope in the green and the side-hill lie in the fairway, sticking it is nearly impossible for most average golfers. But don't tell this to Rudy Catal. In a TV commercial to be aired on WLIX during the upcoming US Open, you can watch Rudy tee off on the 18th and then sink an eagle putt - "In one take," he smiles. Needless to say, he thinks it's a perfectly fair hole. As new as it is, Moose Ridge is understandably still a little rough around the edges, but within the year, these edges will all be smoothed and polished. 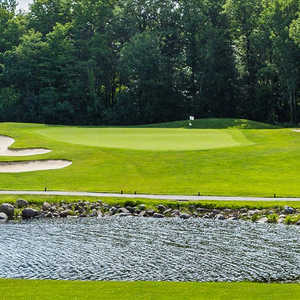 When the clubhouse opens, it will not only feature a complete pro shop and grill, but it will also house the best restaurant in South Lyon and spacious banquet, catering, and conference facilities. Playing conditions are already superb, with only a few drainage issues (after 5 straight days of rain!) and medium-sized, fast, firm greens (9.5 on the stimpmeter). And now that GAM has visited the course, it will soon receive a rating, slope, and official yardage markers (which are notably missing from the sprinkler heads at present). The estimated slopes are: Black - 142-145, Blue - 135-138, and White - 132-134. Tough no matter how you slice it…and even if you don't slice.